Simpler, prettier, and even more fabulous! Can you tell I’m excited? After a lot of time, hard work, and lots of time spent with users, today sees the launch of our new-look Learn My Way – and it’s the biggest (and best) update to our online learning platform in over five years. Throughout this deployment we’ve kept two things in mind: simplicity and the user experience. We’ve long known that many people in the UK have low levels of literacy and numeracy skills, as well as basic digital skills. In fact I recently read some stats which said the 43% of adults aged 16-65 lack the literacy skills that are expected of a 16-year-old, and, 15% of adults are at or below the literacy skills that are expected of an 11-year-old. With these kind of stats in mind, we wanted to make sure that Learn My Way was as simple as possible, so people with low literacy skills – who are most likely to also be the people with low digital skills – weren’t scared off by words and buttons they didn’t understand. There are 12.6 million people in the UK who lack basic digital skills – with almost 6 million people having never been online – so something that is visually appealing and easy-to-use to me (and people like me), could be the most difficult and frightening thing in the world to those 12.6 million people. I personally always thought Learn My Way was a simple online platform. Looking at the new website I can see the improvements. It’s now easier and more user-friendly than ever before and the range of courses ensure that we’re able to help everyone who needs it – from jobseekers, and people concerned about their health, to those looking to follow hobbies online. Learn My Way is user-focused, and the courses are all mapped to the basic digital skills framework led by Go ON UK with the London School of Economics, Oxford Internet Institute, Tinder Foundation and others. We want people to learn what they want, or need, to learn when they want, or need, to learn it. But at the same time, we don’t want to stop there if we can provide progression from the very, very basics up to job seeking, money skills, and health literacy. Doing it in a simple and pretty way is difficult, but exciting too. I’d describe the new Learn My Way as a bit like a swan. On the outside it’s shiny, simple, and beautiful, but under the water line – away from the eye – it’s working very hard. The learning platform produces sophisticated data to not only track the progress of the learners but to demonstrate the impact that they’re having on people’s lives to Trustees, funders and more. This data is available for anyone in the UK online centres network using Learn My Way. If you work in your community, and are not part of the UK online centres network already, it is free and simple for any organisation small or large to get involved, please do get in touch to find out more about how we can help you. I’m so proud of our new-look Learn My Way and I hope that everyone who starts/continues using it will love it just as much as I do. Well done to everyone involved in the process, from the Tinder Foundation team members to the people in communities who were kind enough to help us with requirements and testing. 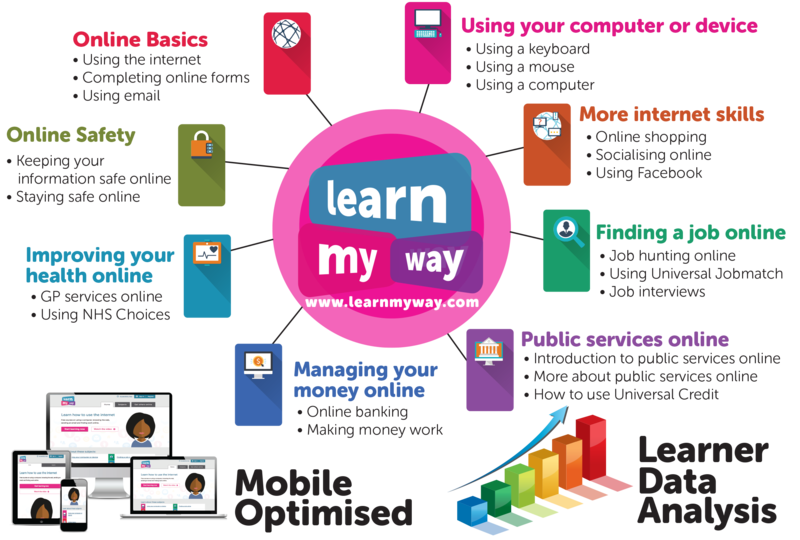 If you haven’t done so already, take a look at the new website on www.learnmyway.com – I promise you won’t be disappointed.